Sixteen semi-finals will be decided on the penultimate weekend of the National U/18 Championships tonight. Boxing begins at 6.30pm at the National Stadium. European Junior champion Callum Walsh, a five-time Irish champion, meets Carrickmore BC stand out Bernard Corcoran in the first of the light-welter deciders with the winner advancing to face either Eric Byrne or James Murphy. Courtney McCrudden, Megan Coleman, Mary Kate Nevin and Catherine Blaney battle it out in the women’s bantamweight semi-finals. European Junior and Schoolboy gold, silver and bronze medallists Edward Donovan medallists Terry Donoghue, Barry McReynolds, Kane Tucker are also in action. 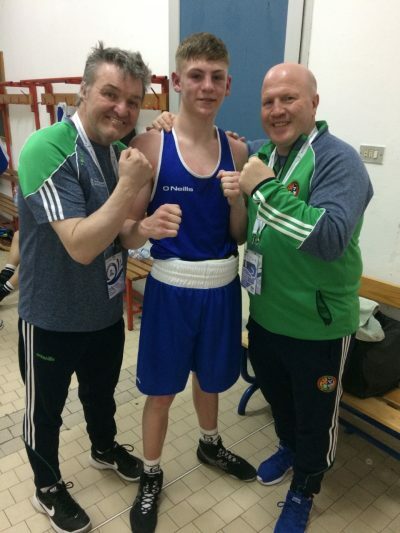 Walsh, Donovan and Brandon McCarthy, who is in against Paul Loonam, are part of an 11-strong Irish squad for next month’s AIBA World Men’s and Women’s Youth Championships squad in Budapest, Hungary, along with Daina Moorehouse and Caitlin Fryers who are through to next Friday/s U/18 finals. Boxers only weigh-in again on the day of the U/18 finals on July 27. The IABA wishes all athletes, coaches and clubs the very best of luck into tonight’s bouts.